Alpena's boys basketball banquet allowed players to receive recognition for their efforts this season. 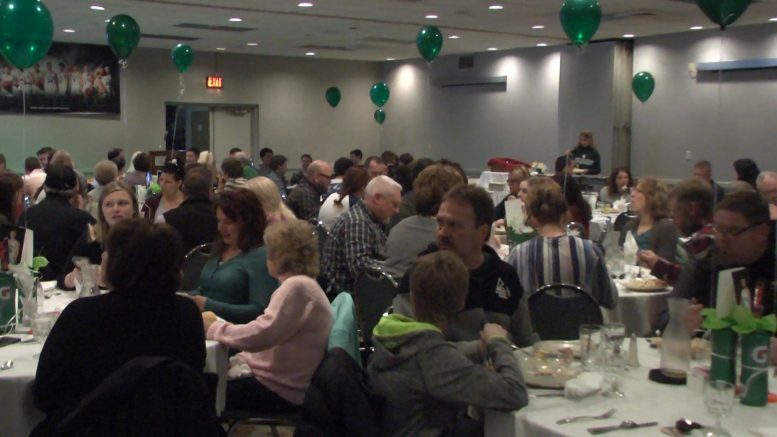 Alpena, Mich — The Alpena boys basketball team held their post season banquet Monday night at the Ramada Inn. The night gave coaches and players a chance to reflect and appreciate their season. Freshman and junior varisty teams received participation recognition, while the varsity team received their letters. Seniors Aidan Goike, Bruz Copping, and Chris DeRocher also received addition recognition for their selection to all conference teams. Goike received honorable mention, Copping received second team honors, and DeRocher received first team honors. The second team recognition means Copping was among the ten best players in the conference. DeRocher’s first team honors recognized him as one of the top five players in the conference. DeRocher was also in the running for Big North Player of the Year, but lost to TC Central’s Tobin Schwannecke. Alpena head coach John Pintar said he thought that this team could be special and that it was among his favorites. The Wildcats saw a great improvement over their 9-11 overall record from 2017-18 by finishing the season 16-5. The team is graduating eight seniors and will have four returning varsity players for the 2019-20 season.